Difficulty: A short and comparatively easy circular walk at altitude but without any steep ascents! 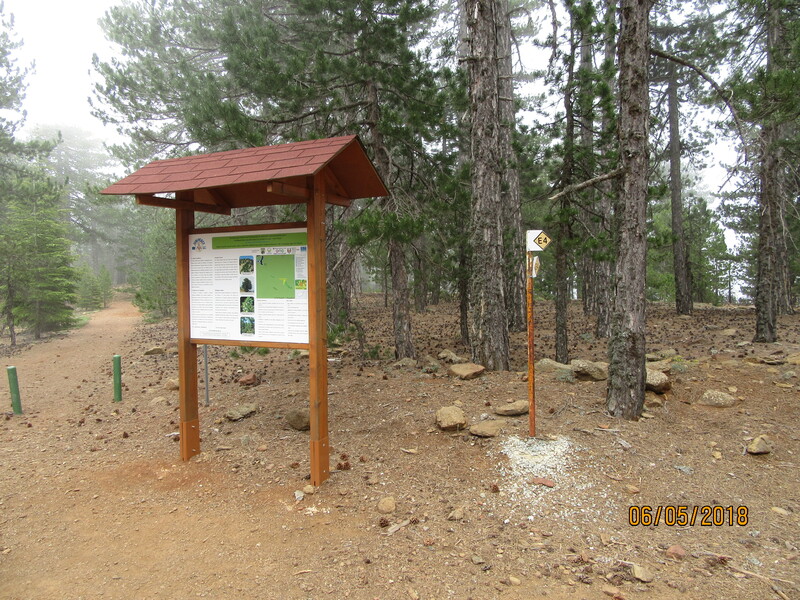 This walk starts from the Troodos Visitor Centre car park which is off the B8 just below Troodos Square. The GPS co-ordinates for this starting point are: 34.9217162N, 32.8774958E. From the car park turn left and walk uphill on the main B8 road for just a few steps, then turn right onto the quiet road opposite, signposted ‘Platres Old Road’. This small winding road used to be the main highway up from Platres to Troodos! Walk along this lovely forest road as it gently ascends to the south shoulder of the Troodos mountain. Ignore the hiking route signposted to your right at 38 minutes and continue ahead on the same track as it gently ascends the southern shoulder of the Troodos mountain. There are fabulous views to your right and on a clear day you will be able to see the wind farms near Paphos, the salt lake at Akrotiri and the Kouris dam. After 1 hour you will pass a wooden bench to your left. Again, ignore the hiking route signposted downhill to your right and continue along the forest road. At 1 hour 3 minutes you will reach a junction with an old green road sign. You will continue along the E4 to the right (i.e. 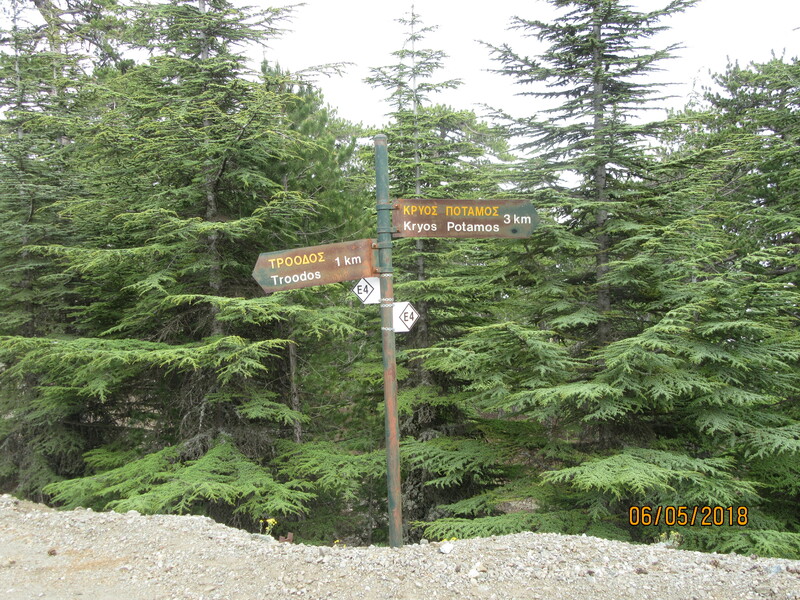 NOT the route signposted to Troodos 1km, and not back to Kryos Potamos 4km) as it winds along the side of the mountain through lovely, peaceful pine forest. At 1 hour 33 minutes you arrive at a signboard which explains the work that the Junipercy conservation project has done in this area. A footpath crosses the forest road at this point. Turn right here to join the Persephone trail. 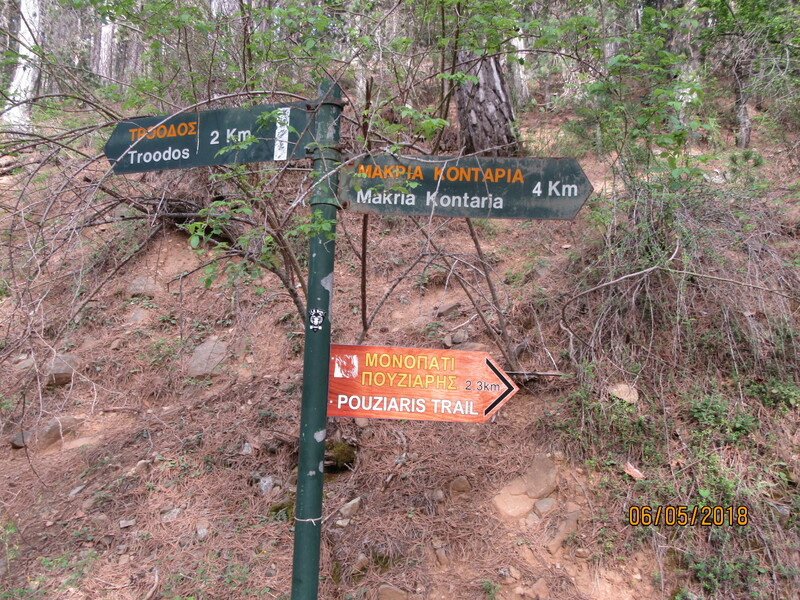 This is quite a popular short trail from Troodos and you may see other walkers, but it is worth walking for 10 – 15 minutes to arrive at an area known as Makrya Kontarka – a high promontory with panoramic views to the north, east and west across the island. There are a few benches here and it’s a good spot for a picnic. Retrace your steps to arrive back at the Junipercy notice board at 1 hour 55 minutes. Cross straight over the forest road and continue ahead on the Persephone Trail as it heads gently uphill, climbing a series of wide steps. 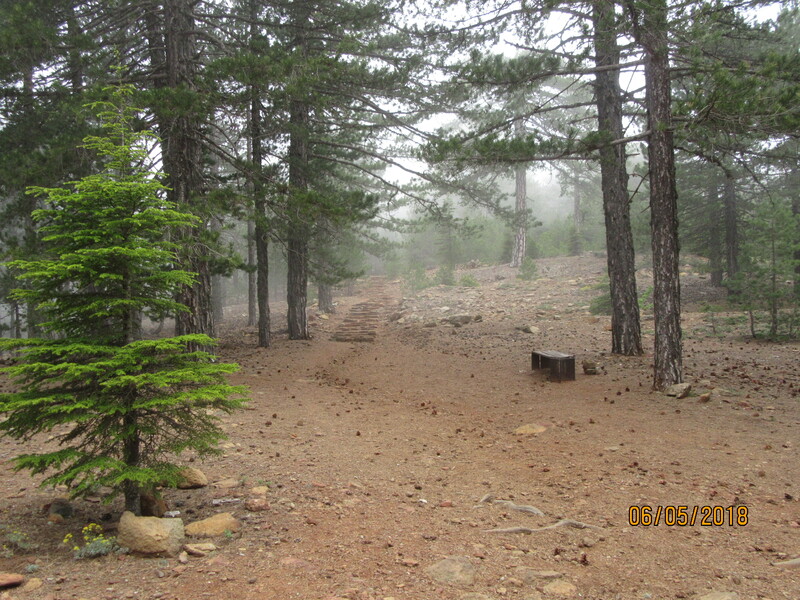 Follow the clear trail, noticing the immense Amiantos Asbestos mine through the trees to your right, and arriving at the signboard indicating the start of the Persephone Trail at 2 hours 45 minutes. 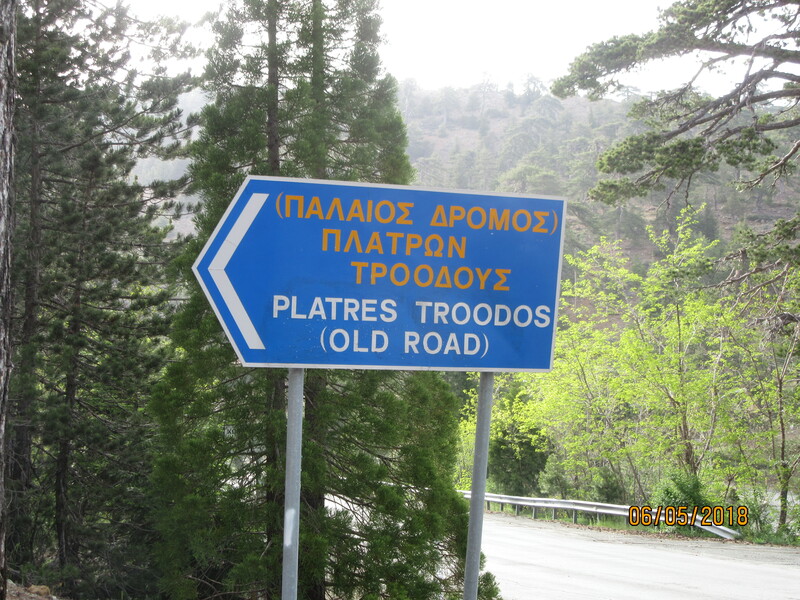 Make your way to Troodos Sqare, either by walking along the short section of road or following the crazy paving path that runs just below it. 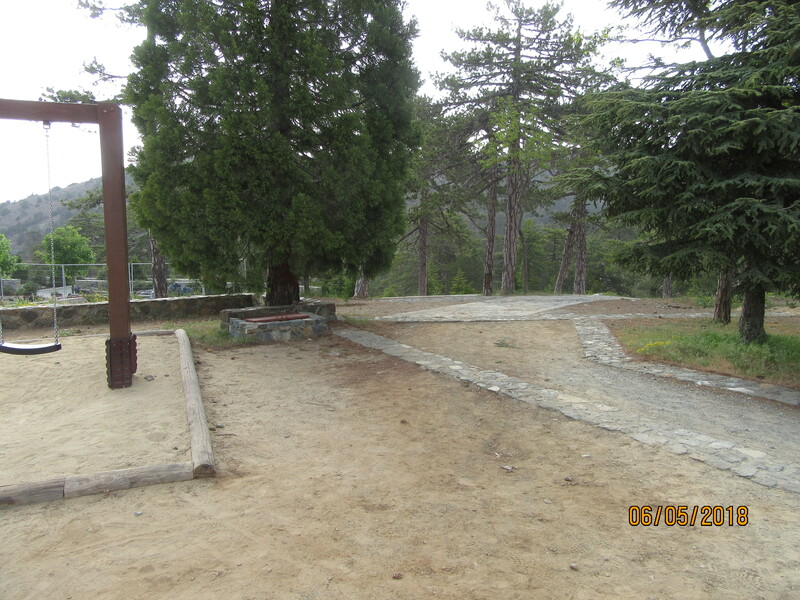 To return to the Visitor Centre car park, walk to the playground at the far end of Troodos Square and you will see a path winding behind and to the right of the playground. This takes you back to your starting point at 2 hours 55 minutes.